Tensions are at a boiling point in an inner-city school where racial violence — Black against Hispanic against White against Asian — has turned the campus into a battleground. To help the kids all get along, an idealistic young teacher (Hilary Swank) encourages her students to keep personal journals so that they can then share their innermost feelings with each other in a peaceful way. $9.405 million on -unknown- screens. Someday I’d love to see a non-comedic movie about a really crummy teacher. He gets a class of smart, high-achieving kids and brings them to ruin. Or maybe he takes on a group of struggling inner city kids and makes things even worse. That’d be something to see. Instead, we get flicks like 2007’s Freedom Writers, the umpty-umpth story of a teacher who inspires great things from underachieving kids on the fringes of society. 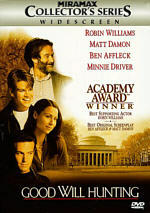 Set in 1994, this iteration of that tale introduces us to the students at Woodrow Wilson High School in southern California. They deal with much violence in their neighborhoods and couldn’t care less about education. They also fail to interact well with each other, at least in an integrated way, as their cliques follow well-established racial parameters. Into this setting comes idealistic Erin Gruwell (Hilary Swank). Against the advice of her father Steve (Scott Glenn) – and eventually her initially supportive husband Scott (Patrick Dempsey) - she becomes a first-time teacher of freshman English at Wilson. There she encounters classes of hardened kids with more concerns about street life than schoolwork. In the face of this backdrop, Erin initially finds it hard to get the kids interested in academics. They all self-segregate based on ethnicity and show no interest in her or her lessons. Eventually she finds a subject that intrigues them: the Holocaust. She uses this topic to break down the ethnic barriers and get the kids involved academics. The flick follows their progress and the obstacles that come along the way. As someone who works in education, I applaud flicks like Writers. They remind us of the work to be done with kids and offer inspiration for those who want to do so. 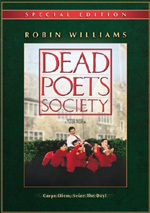 I know that I took heart from Dead Poets Society back in 1989, so if Writers moves someone in a similar way, more power to it. As a film fan, unfortunately, I can’t help but excoriate Writers. At least I can defend Society as a strong flick. Writers, on the other hand, is a mess of clichés and strange tangents that make it a muddled chore to watch. One problem comes from the absolute absence of real character development. Oh, one could argue that lots of the participants demonstrate marked changes. The kids certainly do 180s in terms of beliefs and behaviors, and Erin learns and grows along the way too. Isn’t that what “character development” is supposed to be? On the surface, yeah, but as demonstrated here, I find it tough to accept it as true, natural progression. The characters change in jerky, awkward ways. Usually they simply go kerplop and become different people. There’s little that makes the transitions smooth or believable, as they just occur to serve plot interests. I may find it tough to really claim that Erin does change and grow, now that I think about it. She starts off as pretty full of beans, and that’s the way she ends. Everyone around her throws challenges in her path, but she barely wavers in her confidence. The film depicts Erin almost as Gandhi sort who sticks with a certain routine and forces others to accept it. That glorification seems a little too much to take, as it doesn’t allow her to become a real person. Swank portrays Erin with an abundance of toothy perkiness and little else. That’s largely because the film doesn’t want to let her turn into anything other than Saint Erin, so I won’t blame Swank. Nonetheless, the character doesn’t go anywhere; she exists as a deus ex machina more than a person. Another complication comes from the film’s truly disjointed structure. I can deal with the “kidz in the hood” part and the “teacher reaches the jaded students” side, as I expected both. They integrate poorly, but at least they make sense in this story. That lack of concise blending is a problem on its own, though, and it gets worse when Writers occasionally decides it wants to be Schindler’s List. For a few scenes, the story grinds to an abrupt halt to become a lesson about the Holocaust. Like everything else, it does so in an awkward manner. The tale just stops whatever other momentum it maintains to teach us about the excesses of the Nazis. Of course that’s a valuable tale, but it’s been told many times elsewhere and in much better ways. Writers tosses out little snippets but doesn’t do more than that with them. Nor should it, as that’s not the point of the story. As it stands, the moments that introduce us to Holocaust survivors and tell related stories take us toward pointless tangents. The movie really needs to make up its mind what tale it wants to tell. Is it about the lives of the kids, the efforts of the teacher, or the Holocaust? It mixes and matches so randomly that none of them succeed at all. They just bump into each other without cohesion. To try to blend these, Writers uses excessive voiceover narration. This becomes a crutch, and it over-explains everything to us. The filmmakers lack the confidence to allow us to learn these elements in a more fluid manner, so it beats us over the head with discussion of different components. A little goes a long way. I could continue to discuss the problems found in Freedom Writers, but I need to sleep someday. Three movies crammed awkwardly into one, it never rises above the level of generic inspirational fare. The film occasionally manifests an understated emotional moment or two but it usually beats us over the head with simplified lessons. It simply remains hard to get past the “been there, done that” factor, as we’ve seen eight million movies of this sort already. 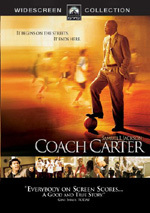 Freedom Writers appears in an aspect ratio of approximately 1.85:1 on this single-sided, double-layered DVD; the image has been enhanced for 16X9 televisions. Though never problematic, the transfer wasn’t stellar. For the most part, sharpness seemed good. I noticed some edge haloes, and the film occasionally came across as a bit soft. Usually I thought the flick was acceptably concise and well-defined, though. I noticed no issues with moiré effects or jagged edges, and the print lacked defects. At times the movie looked a little too bright, and this affected colors. They were fairly accurate, but the film’s design left them as a little faded on occasion. Still, they were usually fine, and blacks tended to look fine. Shadows were smooth and clean as well. This was a good transfer that lacked a certain special quality. To my surprise, the Dolby Digital 5.1 soundtrack of Freedom Writers offered a pretty involving affair. Music presented particularly good activity, as the score and songs filled the environment well. Effects also opened up matters nicely. Much of the flick stayed chatty, but street and some violent school sequences allowed us into the story’s settings in a satisfying manner. Some strong audio quality buoyed the material as well. Speech always sounded natural and concise, without edginess or concerns. Music seemed bright and dynamic. The prevalence of hip-hop allowed the subwoofer to come to life well. Effects were a minor participant much of the time, but when brought into the track, they were clear and succinct. I felt very pleased with this positive mix. Among the DVD’s supplements, we find an audio commentary from writer/director Richard LaGravenese and actor Hilary Swank. Both sit together for this running, screen-specific chat. They discuss the adaptation of the book and the use of factual elements, cast, characters and performances, the story and cut sequences, their own high school experiences, music, and other elements of the shoot. Though the commentary provides a rudimentary look at the production, it suffers from too many of the usual flaws. We get more dead air than I’d expect, and we find tons of happy talk. LaGravenese and Swank praise the film, the actors, the crew, the folks on whom the story is based, and pretty much anyone and anything else that occurs to them. The empty spaces become a particular problem during the film’s second half; the final hour includes precious little actual information. These factors mean that we find a less than invigorating commentary. It gives us some basics but lacks enough to make it truly worthwhile. Four Deleted Scenes last a total of 11 minutes. The first offers nothing more than a simple extension to an existing classroom scene, while the second shows the class on a field trip to see Schindler’s List - like we really need more Holocaust-related content in the film! The latter does give us another dinner with Erin’s father and the kids, and it shows him open up to them more as well as the negative results of a newspaper article about Erin and the students. Those parts make it somewhat interesting. The third clip shows one student as he bonds with a wealthy benefactor, while the last one offers some insights between Erin and Eva. Except for the first piece, the scenes are surprisingly good. Three featurettes follow. Making a Dream goes for five minutes, 26 seconds, as it combines movie clips, behind the scenes elements, and interviews. We hear from recording artist Common and recording artist/producer Will.i.am. They discuss the flick’s title song and its creation. Will also tells us a little about how his school years influenced his involvement. The program doesn’t soar, but it’s a decent exploration of the musical side of things. Freedom Writers Family fills 19 minutes, 21 seconds with comments from LaGravenese, Swank, teacher/inspiration Erin Gruwell and actors Mario Barrett, Jason Finn, April Hernandez, Gabriel Chavarria, Hunter Parrish, Vanetta Smith, Giovonnie Samuels, and Deance Wyatt. We find out how LaGravenese came onto the project and how it got off the ground, cast, characters and performances, thoughts about Gruwell and her impact on the production, the flick’s message and elements of the shoot. The segments that spotlight the real Gruwell prove the most interesting. A lot of these add up to praise since they lather up the happy talk for the teacher, but it’s still nice to see a little about the real person behind the flick. A few other good moments emerge, but the tone does lean too far toward generic positivity. It’s a mixed piece that nonetheless has enough good stuff to work. Next comes the 10-minute and three-second Freedom Writers: The Story Behind the Story. It includes details from Barrett, Gruwell, LaGravenese, Swank, Finn, Hernandez, Parrish, actor Sergio Montalvo and producer Stacey Sher. The piece looks at the inspirations for the flick and aspects of the story. This doesn’t really tell us a lot, as it comes heavy on movie clips and doesn’t feature much insight. A Photo Gallery offers a mix of stills. It gives us 64 shots that combine images from the set and from the film. It’s a passable collection without much substance. In addition to the film’s Trailer, we get some ads at the start of the disc. We find promos for Dreamgirls and Norbit. These also appear in the DVD’s Previews area along with a clip for Transformers. Well-intentioned but trite, Freedom Writers gives us a very predictable inspirational tale. The film’s disjointed structure doesn’t help, as the movie tries to combine a few different disparate tales all into one. It fails. The DVD offers good picture and audio, while extras are decent but a little too full of happy talk. This is a fairly positive release for a flick that doesn’t manage to stand out within its genre.